Some contemplative bad news: Every one of us guys probably should have started getting adequate daily vitamin E intake when we were eighteen or nineteen. That vitamin protects the testes from oxidative damage. Good news: If you’re eighteen or nineteen, you can start getting adequate daily doses of vitamin E to help protect your ‘T-producing’ machinery. Bad news: If you’re eighteen or nineteen and reading this, you probably don’t have the foresighted discipline to start taking adequate daily doses of vitamin E. Such is the usual flightiness of youth. But there are redemptive actions even the seasoned among us can take. Antioxidants and healthier habits have restorative capabilities. You can witness this when a smoker stops smoking, adopts better nutritional habits, and takes antioxidants. Cells become healthier and suppler. The skin shows a marked improvement over time. Some of the deterioration we attribute to “aging” reveals its illusory and reversible nature. The same can go with the leydig cells that produce testosterone. Slow down oxidation and increase the antioxidants to improve their health and better performance should follow. Assuming overall bodily health, this should manifest itself in higher testosterone over time. Probiotics are so-called “good bacteria.” While there are thousands of microbes affecting our bodies, we often think of them all as being causes of disease. That would definitely define the “bad” microbes. But there are live bacterial strains purported to benefit the body and enhance health. This is especially the case for health of the digestive tract. Probably the most widely known group of probiotic is Lactobacillus, a genus found abundantly in yogurt and fermented foods like sauerkraut. Lactobacillus is often cited as helping those with lactose intolerance to effectively digest milk. And this falls in the category of the most widely accepted benefit of probiotics – that of effectively moving food through the gut. But some probiotics also show evidence of being anti-inflammatory and positively affecting the immune system. These qualities might be what led a subgroup of Lactobacillus (Lactobacillus reuteri) to preserve youthful testosterone levels in aged male mice. In 2014, a group of researchers noticed something interesting. 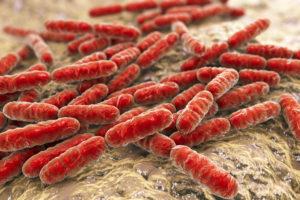 They observed that aged mice that had been given the probiotic L. reuteri appeared significantly younger than their matched, untreated sibling mice. This led the researchers to do another study revealing that mice given L. reuteri also experienced accelerated healing of skin wounds. The researchers attributed these effects to positive immune system response along with down-regulation of pro-inflammatory cytokine II-17 and up-regulation of the pituitary gland hormone oxytocin. What they unexpectedly observed was that aged mice treated to an adulthood of L. reuteri also exhibited unusually large testes and behaviors of male dominance compared to the untreated aged mice. This led the scientists to hypothesize that feeding adult male mice a daily dose of L. reuteri might preserve the rodent’s youthful testosterone into older age. Hence, their next experiment. In directly studying L. reuteri’s effect on testosterone, the researchers divided mice into two main groups. One group received standard feed over a period of months while the other received a ‘New Western type Diet (NWD) consisting of high fat, low fiber, and low levels of vitamin D and B vitamins. The purpose of the NWD was to mimic the effects of a typical human fast-food diet. Each of these two groups was further divided in two, one of each subgroup receiving daily doses of L. reuteri in their water while the control groups received no probiotic. The animal’s testicular weight, leydig cell numbers, and testosterone levels were measured at 7 months, 9 months, and 12 months of age. In other words, their testes health and T-levels were monitored through middle to old age, in mouse time. In both diet groups of L. reuteri fed mice, youthful testicular weight was maintained and testosterone output was “profoundly increased.” In other words, the positive effect of the probiotic on testes health and testosterone output overrode any negative effect of pro-inflammatory junk-food eating. Leydig cells of aged mice that were given L. reuteri throughout adulthood (right) are spared from lesions and atrophy afflicting leydig cells of untreated mice (left). So in a nutshell (no pun), L. reuteri prevented age related testicular atrophy and maintained high testosterone output, from young to old age of mouse adulthood, regardless of dietary practices. The mice receiving the probiotic completely avoided age-related hypogonadism. So should we all have started eating L. reuteri enriched yogurt at nineteen years old, washing down our vitamin E supplements with it? Even though that question is asked with a bit of tongue-in-cheek contemplative remorse, it’s meant to highlight an obvious question unaddressed by the study. After all, not only was the research done on rodents, the probiotic was given to test subjects for their entire adult lives. Nowhere do I see a follow-up study in which older mice were interrupted from their fast-food lifestyle and given an L. reuteri intervention. A study like that could reveal pertinent information for humans, along with (obviously) a human study. But there are compelling tidbits brought up by the researchers nonetheless. For example, they cite earlier studies showing that westernized diets and lifestyles are associated with conditions often attributable to low levels of anti-inflammatory interleukin-10. They point out that vitamin D works in conjunction with IL-10 to protect against these inflammatory disorders, adding that western diets are often also deficient in vitamin D. I can’t help but hypothesize in my own mind that this could be the missing step in vitamin D supplementation, and the reason the “sunshine vitamin” by itself often provides lackluster benefits in the realm of natural testosterone enhancement. Above all, the study shows how gut microbes can modulate gastrointestinal immunity resulting in systemic effects on the immune system. This can subsequently reduce inflammatory responses and activate metabolic pathways that restore tissue homeostasis and overall health.